Atlanta, GA, April 9, 2018: This was music for the soul- free-flowing, versatile and transcendent. Grammy Award winning Mohan Veena maestro, Padma Bhushan Pandit Vishwa Mohan Bhatt ably accompanied by Aditya Kalyanpur on the Tabla treated over 600 lovers of Indian classical music to a concert they will forever remember, at the Rialto Center for the Arts on March 25, 2018. 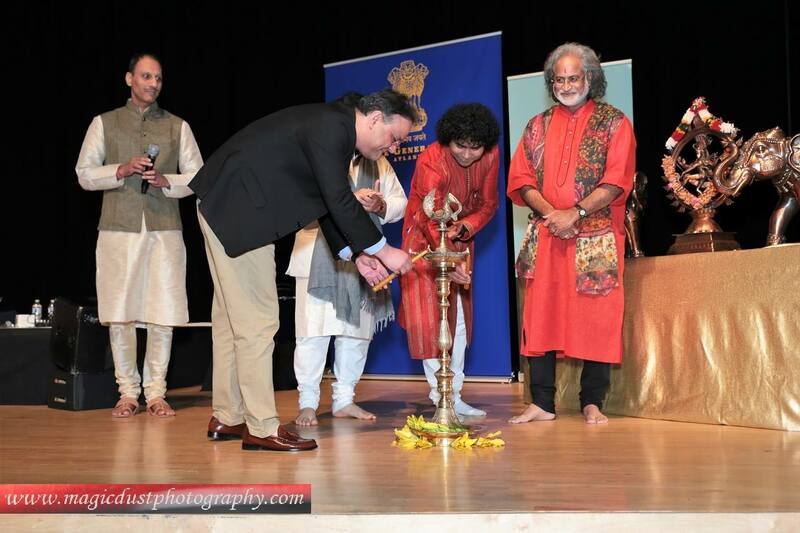 The concert was presented by the Consulate General of India, Atlanta and Sangeetayan. Introducing the artistes, Tarun Talwar said Pandit Vishwa Mohan Bhatt is a musical giant who has invented and contributed a new musical instrument to Indian classical music. “The Mohan Veena is a superb improvisation of the Hawaiian guitar, which has captivated audiences around the world for five decades. 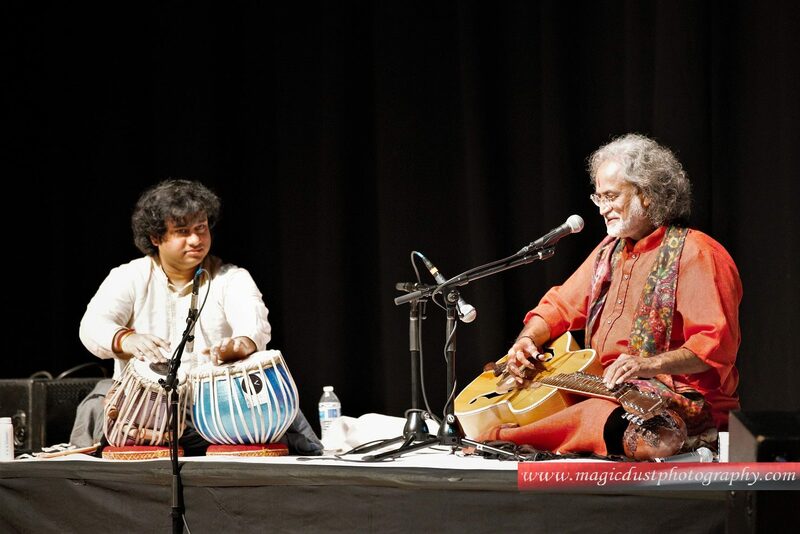 Pandit ji combines the gayaki ang and the tantrakari ang with real virtuosity and command,” he said. One of the foremost disciples of Sitar maestro Pandit Ravi Shankar, Pandit Bhatt has performed in 80 countries including at such prestigious venues as Madison Square Garden, The Lincoln Center, Royal Albert Hall etc. Tabla maestro Aditya Kalyanpur, who was initially known for his debut performance with his guru Zakir Hussain for the Wah Taj! commercial when he was 11 years old, has worked with some of the most legendary individuals in the music industry. His playing can be heard on Katy Perry’s “Legendary Lovers” from her multi-platinum album “Prism”. He has also recorded with The Rolling Stones’ Keith Richards and performed with Oscar and Grammy winning composer A.R. Rahman. He is the founder of the New England School of Music in Boston, MA and the Shyamal Music Foundation in Mumbai– a non-profit created to promote, preserve and propagate Indian classical music by giving a platform to the next generation of talented musicians. Pandit Bhatt described his music at length before the duo began playing. He said Indian classical music has a tradition that goes back 5000 years. Since then, it has been maintained by musicians whose role has been not only to memorize the nuances and compositions, but also to contribute to it and give it new dimensions. “This is recent music- very well thought and developed and authentic,” he said. The musician tries to maintain the purity, the pious sound of the raga, but he also puts his soul into it, decorates it and makes it live. Each raga has its own emotion, character and mood. Our music is supposed to be spiritual in nature- good for meditation, concentration, and for the purification of the heart, body and soul, he said. Pandit Bhatt said the beauty of Indian classical music lies in improvisation. A large part of the performance is not pre-decided, pre-rehearsed or pre-composed, so when the musician starts to play, it is like a painter with a blank canvas. He lets his imagination take over. Hence, each concert is unique, because the music is never repeated. The concert began with a traditional instrumental alaap, starting with the lower octave and gradually progressing to higher octaves, depicting the aesthetics of each note. The Tabla joined the Mohan Veena in the second part, to play the Vilambhit Gat, a slow composition, where swar and the symmetrical tri-taal went hand in hand. The third part, the Dhrut Gat, was an improvised fast composition, with an alert Kalyanpur effortlessly keeping pace with Pandit Bhatt. This was musical magic at its best. Another highlight of the evening was the soulful rendition of the Vishwa Ranjini, a raga created by Pandit Bhatt and dedicated to his mother. Raga Vishwa Ranjini is a combination of the Madhuvanti and Shiv Ranjini and is suffused with shringar ras (romanticism) and emotions. “It also has pathos, as if you are missing somebody,” Pandit Bhatt said. The maestro coaxed the audience to sing the chorus to the rendition from his album, ‘Music for Relaxation’, which they did, with great joy. The concert also included a rendition of Vaishnavo Janato, a popular bhajan, an energetic interpretation of the Jog Jazz and a strong vocal performance of ‘Kesariya Balam’, a popular folk song from his home state, Rajasthan. The concert concluded with a patriotic rendition of Jana Gana Mana, India’s national anthem. 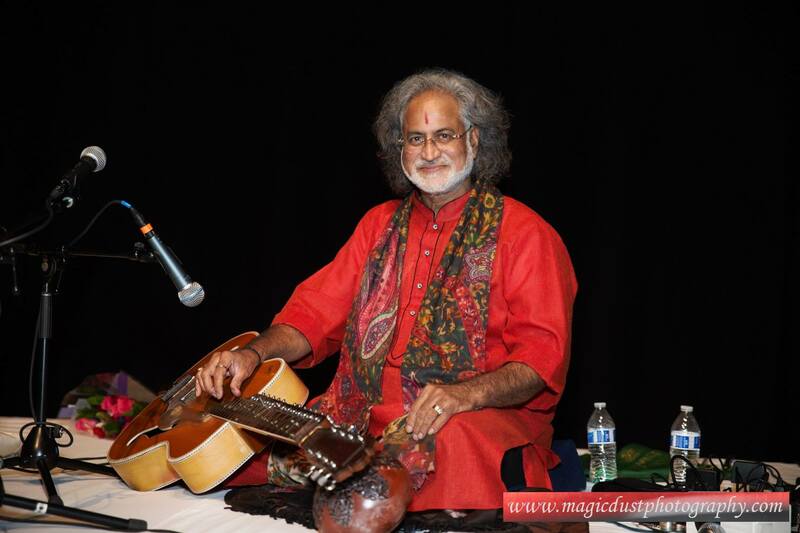 Earlier in the evening, Consul General Nagesh Singh, in his brief address said he had heard Pandit Bhatt perform at a concert in Birmingham, Alabama and was mesmerized. Perhaps, the Consulate could do better at publicizing their classical music events, beginning a few months ahead of time.